Reviewing this book weeks before Halloween seems particularly appropriate; All Hallow’s Eve is, on some level, still about grappling with the spectre of the bones under our skin, while also celebrating the excitement of going out into the dark. 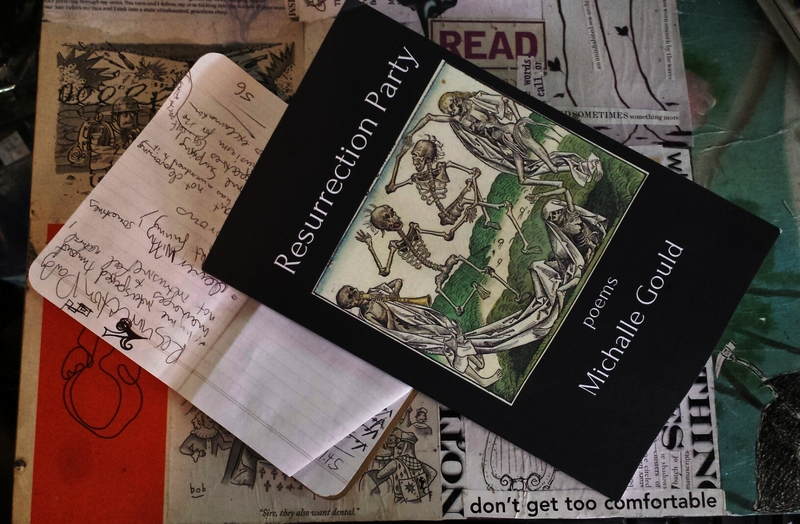 While the poems in Michalle Gould‘s Resurrection Party are often about death, this book is very much alive—a rare book that justifies its exclamation points. It is dark, yet filled with whimsy and weirdness. The dancing skeletons on the cover are only the beginning. While I’ve read many beautiful poems, I’ve read fewer that are beautifully crafted and funny. But many of Gould’s poems are just that, ranging from witty to comical. This humour rarely shouts at us; rather, it winks, as in “Untitled”, which begins, “This was supposed to be a landscape without a person in it, / but there you are—that tree slouches the way you do.” Subtle humour is mixed with contemplation and a sort of longing: “Those broad leaves [ . . . ] They are wounded, then lost, then there they are again! / It must be nice to have such an endless capacity for renewal.” The subject matter of each poem—whether it be death, religion, classic literature, or dinosaurs—is approached without reverence, but the text stops short of mockery. Instead, these poems are filled with empathetic verse that seeks connection and offers up fresh perspectives. With titles like “Self-Portrait as a Rare Book Exhibited at a Museum in England” and “Self Portrait as a Pair of Lovebirds”, her self portrait poems are good examples of her ability to twist around to look at something anew, creating a strange relationship between observer and observed (who is the self in these poems, after all?) worth investigating. These curious poems are succinct; most are less than a page, and the rhyme interspersed throughout binds some of the shortest pieces together tighter still. The poem that begins the collection, “How Not to Need Resurrection”, sets the tone well, beginning with “Children like to play at death— / they hold their breath” and evolving into a fast-paced, clever poem that deliberately skims across the subject of mortality, the hints of a nursery-rhyme sensibility both evading and hinting at the fear that these children have not yet grown into. The collection continues to dance with death to its very last page, sometimes drawing close, at other times twirling away into discussions of Spring and rectangles. As a reader, I enjoyed every cleverly choreographed step. P.S. If you’d like to see more content from The Quilliad Press, please consider backing our Kickstarter (we’re a staff pick!). In addition to our small press book reviews, we post project spotlights, artist profiles, parrot poetry, and coverage of local arts and literary events. We also publish a literary and arts journal, The Quilliad, and are planning a line of chapbooks. Our crowdfunding campaign is 50% funded with 6 days to go. Any support is appreciated. Exciting news! We will be screening “As Equals”, a film by one of our favourite cover artists, Sean G. Marjoram, and one of our contributors, Devin P.L. Edwards, at our issue 5 launch party on May 9, 2015, at Betty’s on King (240 King Street West in Toronto). Add this to your list of reasons to attend. The film is an adaptation of a poem by Devin and includes the poem as a voiceover by one of the film’s cast.